I saw this idea somewhere...my apologies for not crediting. 2. They painted white paint inside the oval, encouraging texture. 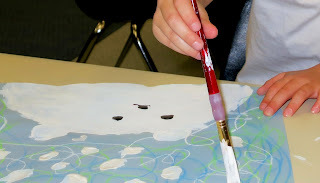 Another good idea is to use shaving cream mixed into the paint with glue to add some texture. 4. In the background use light green/turquoise and white chalk to make "wind" swirls. Encourage them to go all around the bear, not just in one spot. Blend a little with fingertips. 5. Paint the snow flakes by twisting the brush in a circle motion. 6. Paint two black eyes and larger black nose. For the finishing touch... put a little white glitter on the top of his nose! Interdisciplinary ideas: For Kinder, tie into social studies, science and reading. 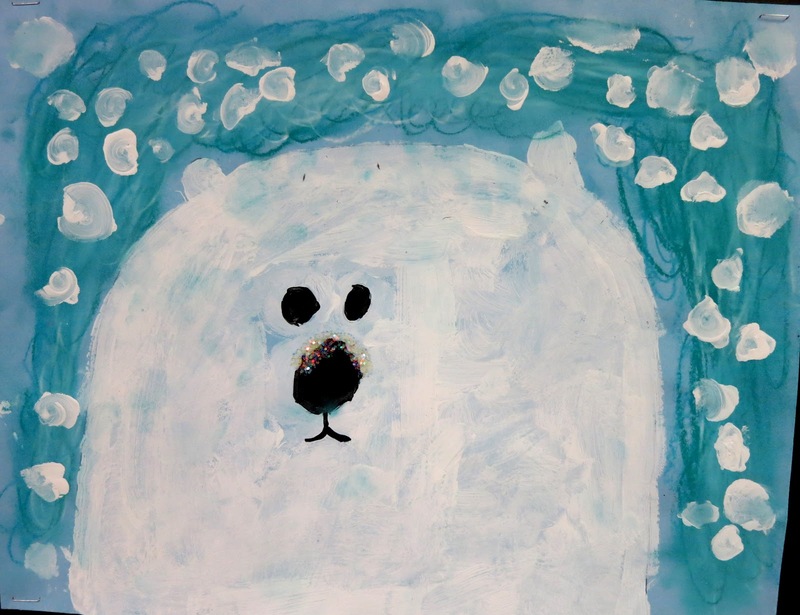 Ask students to recite something they know about polar bears, write it down and attach to the bottom of their artwork for display. The learning point of polar bear environments can also be incorporated.